I don't know about you guys but for me the last year and the remainder of this year has been filled with new babies!! While I am not a mother myself I have seen the use of and heard talk of things you must have for that new little one. Obviously these things are all relative. Just feed that baby and rock it to sleep...that is about all it needs. Well, maybe a diaper change here and there. But anyway, as buying for new moms is on my mind I figure it must be on the minds of some of you guys too. If you are looking for some fun and maybe unique items I thought I would help you out. And some of these items are as low as $25! Bob Stroller: I have actually babysat a sweet boy once who had one of these...it was super awesome. The Yellow Pacifier Unisex Diaper Bag: Don't give that new dad an excuse to not carry the diaper bag. Graco Sweet Slumber Sound Machine: I read some reviews and this one was at the top. Bumbo seats: Everyone loves these. And they look cool too. Ergo Baby: So everyone loves these too. And men aren't scared to wear them. And sometimes babies don't like to go to sleep but for some reason these help. WubbaNub: So apparently these things help keep the paci in. 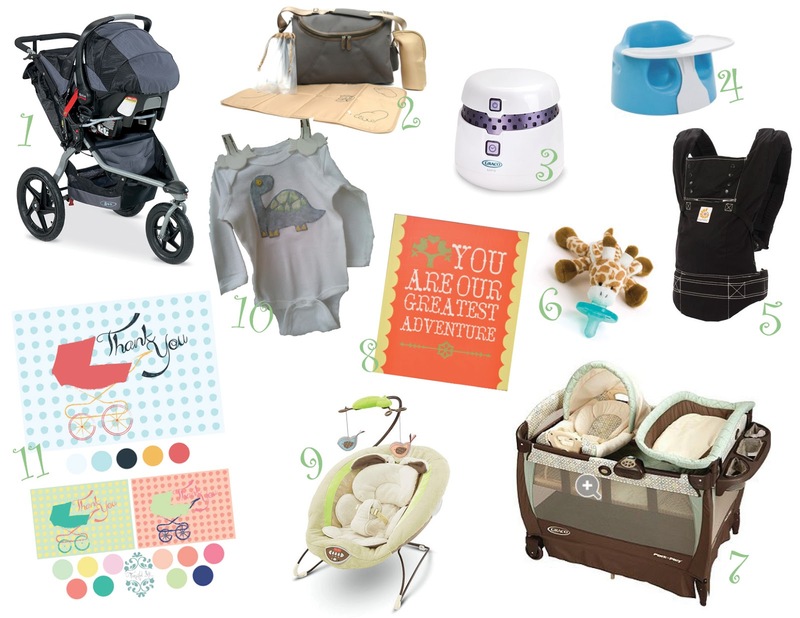 Pack n Play: So when travel with a baby happens this is a must. And look how fancy this one is. Garland & Pendant Art: Ok, every baby needs some art for their walls. Love this Etsy shop. Fisher Price SnuggaBunny Bouncer: Also all the rage. Finley Twisted Custom Clothes: Put your baby in some custom designed clothes! There are also some great items for the big brother or big sister if this isn't your first. Fanciful Ink Stationary: Last but not least...While not every mom writes Thank You notes it is nice for them to know that is something the don't have to remember to buy. You could also gift some birth announcements with your favorite designer so all they have to do is send in the info once the baby comes. And more than that, I have a client who is gifting a newborn photo-shoot ..how sweet is that?! Gifted photos with gifted stationary or announcements...pretty amazing. Go forth and gift confidently and congrats to the new parents out there!